Today, I gave a talk at Bruegel’s Asia Europe Economic Forum (AEEF) on Global Value Chains (GVCs) and restrictions on the use of digital technologies across borders. It was part of a panel session that was dedicated to GVCs and the 4th Industrial Revolution. It was a great opportunity to connect our Digital Trade Restrictiveness Index (DTRI) with that of GVCs. The underlying question of my presentation was: How much of an important factor are digital trade restrictions for GVCs? As it turns out, a lot! When talking about the 4th industrial revolution, we often talk about many different concepts such as Artificial Intelligence (AI), Internet of Things (IoT), big data and cloud computing. One commonality these technologies have is the use of data over the internet. 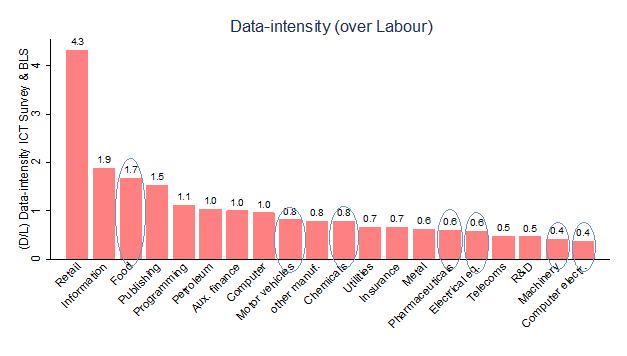 The figure below shows which sectors in the economy use a lot of data, and are therefore intense in the use of digital technologies. Interestingly, besides many services that are data-intense, some advanced GVCs are in fact also very data-intense (something I referred to in February this year in another blog post). Computer electronics, Machinery, Chemicals and Motor vehicles are sectors that thrive on GVC networks and the figure shows that these sectors are also very data-intense by using lot of digital technologies. Now, how do digital trade restrictions come into the story? The answer is simple: as these GVC sectors use a lot of digital technologies, digital trade must surely be a factor of importance of how competitive such sectors can be. After all, open markets provide firms with the best available technologies through competitive goods and services, and thus also competitive digital goods and services. That’s indeed the case. That becomes visible in the following figure. 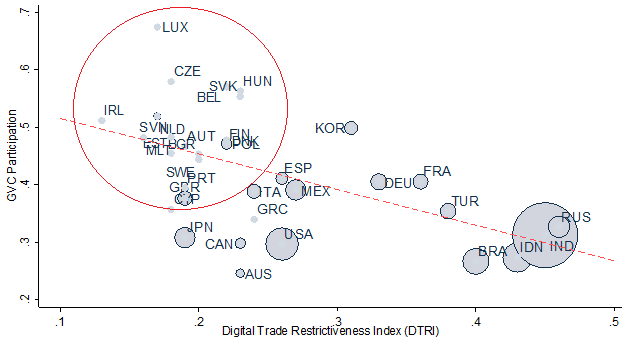 In there, the DTRI is plotted on the horizontal axis, measuring the restrictiveness in digital trade for a host of countries; whilst the vertical axis plots a measure of GVC participation, which is nothing else than an advanced indicator that measures the extent to which countries show more or less trade in GVCS. As we slide along the horizontal axis from left to right, we see that countries which are more restricted are also showing a lower participation in GVC sectors. Conversely, if we move along the horizontal axis from right to left, we see that countries with lower levels of digital trade restrictions precisely have a higher level of GVC participation. Therefore, digital trade restrictions really seem to matter for participating and being competitive in GVCs. There was more in my presentation that warrants another blog post. But one thing I would like to tell is that besides how much a country participates in GVCs, digital trade restrictions also appear to matter a lot for where countries are active in GVCs. So not only do digital trade restrictions matter how much a country capitalizes on GVCs, but also where in the supply chain they are active. As it turns out, they are precisely active where services come in. But that’s for a second blog post later on.